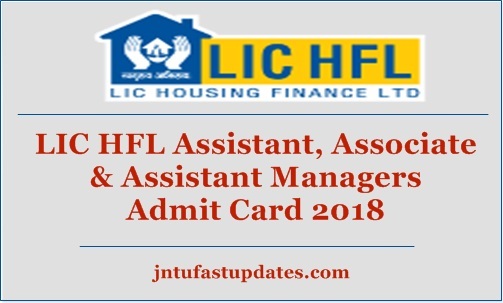 LIC Housing Finance Limited (LIC HFL) Assistant, Associate, and Assistant Manager screening test is going to be conducted in the month of October. The organization has scheduled the Assistant written test on 6th and 7th October (Tentative) respectively. Hopefuls applied for LIC HFL posts 2018 will have to download the admit cards to proceed with the test. Applicants can get their admit cards from the LIC HFL official portal, lichousing.com. All the applicants are hereby informed to carry the admit cards while going to the examination. Candidates will not be allowed to attend the exam if they do not show the admit cards. Candidates who are going to attend the LIC HFL Assistant examination can check the hall ticket release date, steps to download the hall ticket, and more guidelines for the examination from the following article. LIC Housing Finance Limited (LIC HFL) is the separate wing of LIC it exclusively works for the housing schemes and other housing-related operations. The organization provides various jobs for the eligible aspirants every year. This year the LIC Housing Finance Limited has released the notification for 300 Assistant, Associate, and Assistant Manager posts. Many of the hopefuls having the suitable eligibility standards have applied for LIC HFL posts 2018. The organization has accepted applications from a huge number of aspirants in the months of August/September. The application process has continued from 21st August to 6th September. Hopefuls applied for Assistant and other posts in LIC HFL will have to appear for the written test and interview rounds. Candidates selection will be done on the basis of merit. Candidates who qualify the written test with good merit will be shortlisted for the interview round and candidates finally qualify the interview round will be appointed in the announced designations. Hopefuls applied for Assistant, Associate, Assistant Manager posts in LIC HFL will have to attend the screening test on 6th and 7th October. Candidates applied for LIC HFL posts can download the admit cards from 24th September by visiting the official portal, lichousing.com. After downloading the admit card, check the details of examination venue, date, timings from the admit card. On hall tickets, the organization will provide the information of candidate such as candidate’s name, register no/hall ticket no, father’s name, date of birth, candidate’s signature and photograph, and other particulars. Check all the printed details clearly after downloading the hall tickets. Candidates must carry their admit cards/hall tickets while going to the examination. Reach the examination hall before 30 minutes of the examination time. Carry any of the valid identity proof copy such as aadhar card/ driving license/PAN Card/Passport or any other copy for candidate’s identity verification. On the homepage, the hall ticket link will be displayed. Check the hall ticket and take a printout of it; preserve it safe to carry to the examination.